Superior productivity and speed, coupled with low heat input are resulting in laser welding processes replacing the more conventional welding methods. Some of the advantages that laser welding offers include better weld strength, smaller heat affected zones, tighter precision, minimal deformation and the ability to weld a wide range of metals/alloys including steel, aluminum, titanium and also dissimilar metals. FLOW-3D provides powerful insights into the laser welding process and ultimately, helps achieve process optimization. With better process control it is possible to minimize porosity, heat affected zones and control the micro-structure evolution. FLOW-3D is uniquely suited to simulate the highly complex weld pool simulations because of its free surface tracking algorithm. The WELD add-on module was developed to further incorporate relevant physical models into FLOW-3D such as the heat flux produced by laser source, evaporation pressure on the molten metal, shield gas effects, recoil pressure on the melt pool and multiple laser reflections in keyhole welding. It is important to capture all the relevant physical phenomena to have a realistic process simulation. 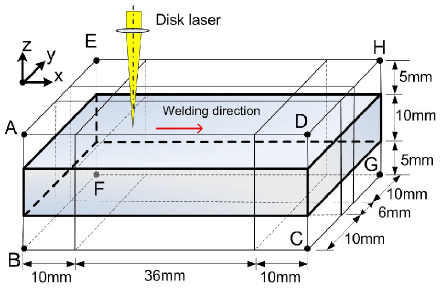 FLOW-3D can simulate both conduction and keyhole modes of laser welding. 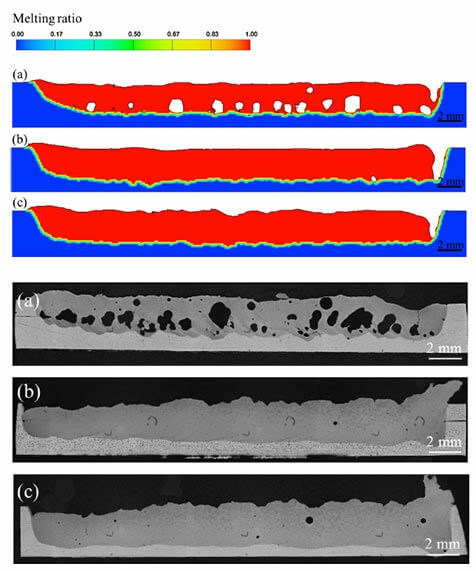 Researchers around the world use FLOW-3D to analyze melt pool dynamics, optimize process parameters to minimize porosity and even predict crystal growth in laser welding repair processes. Shallow penetration weld (top left); deep penetration weld with shield gas effects (top right); deep penetration weld with shield gas and evaporation pressure (bottom left); and deep penetration weld with shield gas, evaporation pressure and multiple laser reflections effects (bottom right). KAIST in Korea and BAM in Germany have carried out full penetration laser welding experiments on a 10mm steel plate using a 16K kW laser. With the help of CCD cameras, they could capture the top and bottom melt pool dynamics formed because of full penetration laser welding. They also simulated the process in FLOW-3D and achieved good agreement between the simulation and experimental results. 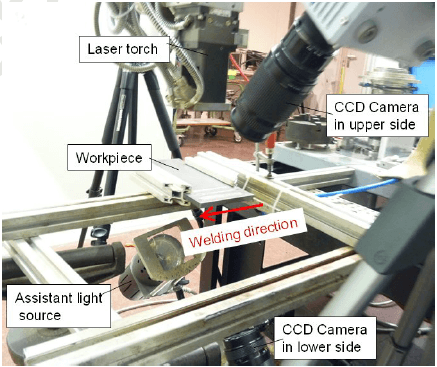 General Motors, Michigan and Shanghai University in China collaborated on a detailed study to understand the influence of process parameters, namely, welding speed and welding angle of inclination on the occurrence of porosity in keyhole welding. Weld porosity in laser-welded Al joint’s cross section. Keyhole induced porosity occurs due to flow dynamics and can initiate cracking. Optimized process parameters can mitigate this kind of porosity. Using FLOW-3D, the researchers accounted for all the important physical phenomena including evaporation and recoil pressures, melt pool dynamics, temperature dependent surface tension and Fresnel absorption during multiple laser reflections within the keyhole. Based on the simulation models, the researchers identified unstable keyholes as the primary cause of induced porosity in keyhole welding. 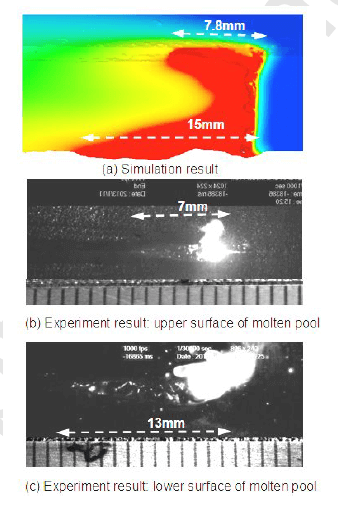 The excessive re-circulation in the rear molten pool as seen in the images below, caused the rear molten pool to collapse on the front molten pool wall and trap voids that result in porosity. It was when these trapped voids were captured by the advancing solidification front, that porosity was induced. At high welding speeds, there is a larger keyhole opening and this generally results in a more stable keyhole configuration. Using FLOW-3D, the researchers predicted that high welding speeds and large weld angles of inclination mitigated porosity.